To continue....The ballot counts for vote by mail elections come in batches over a period of days. The auditors were not then (and probably are still not) allowed to count ballots before election day after the closing of the election. So I dutifully pulled up a spreadsheet and began to segregate 'per reported batch' the percentage of votes for the candidates I had supported. What I saw shocked me. My candidates were all underdogs. They trailed in early voting, but as the batches came in, at least two showed promise of either winning of making it to the second round of voting. And then, just when some promise was being shown, their percentages of votes in subsequent rounds all tailed off in seemingly neat, parallel curves leaving their opponents to win. This provoked me to carefully examine my ballot, the Sequoia voting machines, the Whatcom County Auditor, and the integrity of "Voting by Mail." Everything that I found scared and shocked me. I went so far as to visit the County Auditor and review the lists of disputed ballots, requested and received technical specifications for the Sequoia voting machines, and talked with the head of elections in Whatcom County. He was a very nice man, but of course, my article had caused some backlash and he cautioned and complained to me about creating "lack of faith in government". Actually, I understood his complaint. This is a small county, voting regulations and practices are largely state determined, HAVA was just being implemented, and as the electioneering head pointed out, they hadn't even given him enough funds to put a card-key lock on the voting machine room door! The Whatcom County Auditor's Election Division was sensitive to quite a bit of my (and other) criticisms that they could respond to and they did make changes. No longer was the "printer's code" attached to your mailed in ballot. That removed a possible globally unique identifier from a tabulated ballot. They also made it a point to tell their electorate to use only black or blue ink. This, was a significant reform. You see, the electronic equivalent of "hanging chads" is a phenomena known as "bleed through". 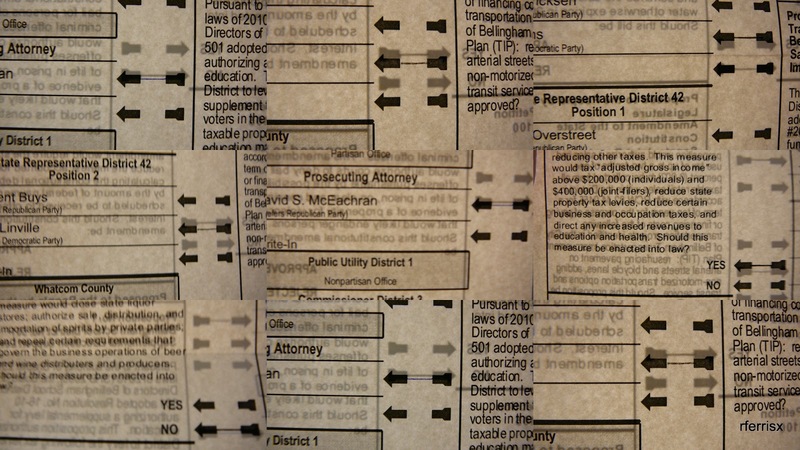 In "bleed through", a mark on one side of your ballot is pressed or inked too heavily and so it can be seen by the vote counting scanner as an "ambiguous mark" (or quite possibly just a mark) on the other side of the ballot whose "completed" arrows too closely align. This was a terrible problem for the election I was PACing in - literally hundreds of ballots had to be "manually reviewed" because of "bleed through". I was let into the ballot storage room and reviewed the page on each ballot box where "bleed throughs" had been marked as unreadable by the Seqouia voting machines or the ballot reveiw process and thus sorted out for manual review by a select committee. How close do your candidate selections on one side match the initiative selections on the other? 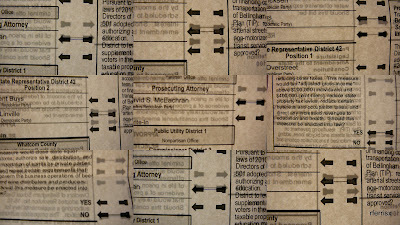 Let's hope The Sequoia 400C Optical Scanners don't have any ambiguity with these completed arrows on my ballot! The only advice I can think to give you on this dear voter, is to be careful when you mark your ballot. Perhaps pull off the removable printing tab and experiment first with your available selections of blue and black ink pens to find find out which weapons of choice "bleeds through" the least. Then use a ruler to complete your arrows, pressing only as hard as necessary to make a legible mark in exactly the center of the arrow! But don't press too soft, otherwise it may not be read! (1) Don't spill any food or water on it. The machine or process will kick those out. There will be a nice box for your ballot there. You can get an "I voted" sticker or two and you will know that no intermediary (local party member, the post office, agenda driven spook, etc.) had any possibility of intercepting your ballot on the way to the Auditor's office. Whatcom County's implementation of "Privacy by Design(TM)" "Secure Ballot System" puts your VoterID and PrecinctID on the front of your "Vote By Mail" envelope. The election office may scoff at me for this insight. But the chain of security that leads from your voting drop or your post office to your election office may not be secure. This issue is known as the" Chain of Custody" problem and it is well-discussed on the internet. Therefore, dear voter, if you have the time, take a trip downtown and drop off your ballot by hand. This will take one less "insecure chain" out of the "Vote By Mail" loop. Perhaps then all we would have to worry about are the "impartiality" and "security" of those damn vote counting machines...and your election office. Good Luck!! !